Yesterday was busy, so I didn’t have a chance to run to the store. You know what that meant…raiding my fridge and pantry and making something out of what I had on hand. Well, it certainly helped that I had some inspiration…and that inspiration came from Dimple over at Shivaay Delights. She recently made these delicious looking chocolate snowballs (which I do hope to try at some point). Her recipe inspired me to make a ball of yumminess that was low-glycemic and that I didn’t actually have to cook! 🙂 Thanks Dimple! After measuring out the walnuts, put them in a food processor until they become small pieces. Cut the orange in half, and squeeze all the juice from both sides into a large bowl. Melt the coconut oil, and add it to the juice. Add the honey and vanilla to the juice mixture, and mix thoroughly. In another bowl, combine the flour, small pieces of walnuts, cinnamon, and chocolate chips, mixing well. Now combine all the ingredients together in the large bowl. Make small balls with the dough, placing them on a non stick baking pan, or you can line another dish with wax paper and use that. Just make sure the balls are not touching one another. Lori was inspired and now so am I! No problem Dimple! By the way, wanted to say thank you….because you re-blogged my post I have had tons of visitors and met some really nice people! Thanks so much!! Awe, thank you so much for your kind words Dimple! I am inspired by anything with walnuts in it. These look scrumptuous! Thanks for stopping by Serena! I love walnuts too….yummy! Thanks Lisa! I have lots of dark chocolate recipes on here on the recipe page, so feel free to check them out. I have some awesome muffins I love with dark chocolate chips! 🙂 I was actually just looking on your blog when you wrote this. I am excited to see your recipes! Sounds like we are doing the same thing, because I am checking yours out as I write! 🙂 Enjoy! I love that these have all natural ingredients. When I make them, I will be using pecans, instead of walnuts as I don’t like walnuts, but I have been told any nut will work, so feel free to experiment!! I am so excited to try these!!! Thanks again Joanna….you are so sweet! Awe, thanks Joanna….you are so welcome! Wow these sound and look fantastic. I am now about to pop over to Shivaay Delights too. Thank you. My pleasure Tabitha! So glad you stopped by, and glad these sound good to you! You will find that Dimple’s recipe at Shivaay’s Delights looks and sounds fantastic too! Ok so Lori – you are telling me you are eating these raw and not cooked?????? Oh My!!!!! Oh, these look sensational! 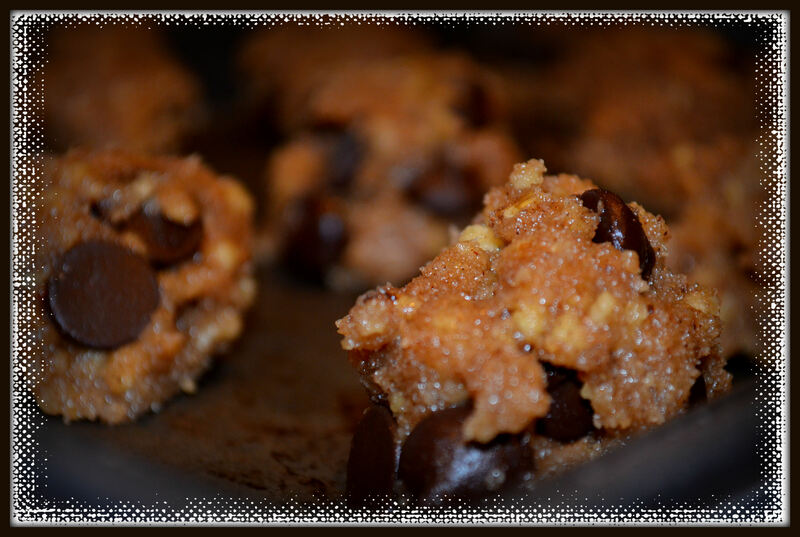 Your recipe and pictures are making me salivate and I love the idea that they are low glycemic. Awesome! Thanks for your sweet words Julianna! I am new to cooking and creating my own recipes, so this is definitely an encouragement to me!